When servicewomen and men leave the armed forces, their care transfers to the statutory and third sector where the quality and provision of services can vary enormously. This edited book, encompassing a range of perspectives, from service user to professional, provides a comprehensive overview of services available. Each chapter, in turn, examines the policy underpinnings of systems and services covering the psychological health and social care of military veterans and then focuses on the needs of a discrete number of types of military veterans including early service leavers, veterans in the criminal justice system, older veterans and reservists, together with the needs of the children of veterans’ families. "It is often, and erroneously, assumed that veterans form a homogenous population. This book ranges widely across the Armed Forces Community and draws important distinctions between its various constituent members. Adding complexity to the landscape of those needing mental health services, are the many factors affecting how those services are delivered – through policy, geography and the very nature of the delivery organization. By bringing together in a single volume such a mass of contemporary knowledge and practice, the Editor has delivered insight and understanding: an essential read for those involved in this important sector." Air Vice-Marshal Ray Lock CBE is Chief Executive of the Forces in Mind Trust. "Much has been talked and written about military veterans and Post Traumatic Stress Disorder in recent years, but hitherto there has been insufficient research and understanding of the wider issues involved. Led by Professor Jamie Hacker-Hughes, the highly-distinguished authors of this book provide a detailed analysis of just who makes up the British military veteran cohort and exactly the nature of their needs and challenges after service in the Armed Forces. "Military Veteran Psychological Health and Social Care" will be of equal value to the health professional and the general reader in the drive to improve life for veterans after their service for their Queen and Country." 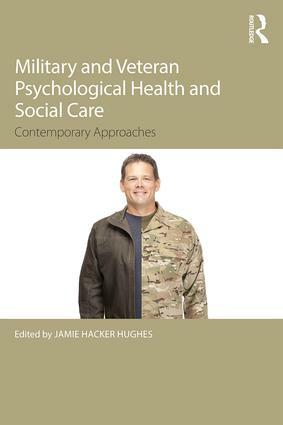 "Probably the last, comparable book to Military Veteran Psychological Health and Social Care on the health of UK veterans was published in 2009 (by the Kings Centre for Military Health Research). This new book provides a valuable update. It also contains some nuggets of real gold." Jamie Hacker Hughes is Visiting Professor and The Founder Director of the Veterans and Families Institute at Anglia Ruskin University, past President of the British Psychological Society and former head of the Ministry of Defence’s healthcare psychology services. A clinical psychologist, neuropsychologist and psychotraumatologist, Jamie was the author, with Mark Neville, of ‘Battle against stigma’ and before his career in psychology Jamie was a short-service army officer.